Machined from aluminum rods with one end tapered to 4.8mm in diameter. The specimen can be oriented and mounted to the tip with glue and it is ready for sectioning. The body size is "00" and it measures 11mm long. 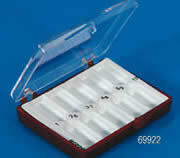 Beem Embedding Capsules, Size 00, 8mm I.D. Polyethylene embedding capsules with 1x1mm face at the tip of a truncated pyramid, each with a hinged cap. Available in two specially shaped capsules which are designed to overcome commonly encountered embedding problems; such as, small or thin elongated specimens and powder samples. These capsules are also good for centrifuging precipitated matters and allows for less trimming. The bottle neck capsule produces a 7.9mm OD block with a hemihyperpoloid (rather than faced) tip. *BEEM® Is A Registered Trademark of Better Equipment For Electron Microscopy, Inc.
Added to our extensive line of embedding capsules is our flat bottom capsules, which are made from polyethylene, and are 8mm (just like the standard 00 capsules) in diameter. Also available in Microwave-Safe Polypropylene. These holders are used to hold capsules upright during the resin embedding stage. The cavities (22) allow for illumination from the bottom of the holder for specimen orientation. Use the clear if microwaving or UV polymerizing your embedding media. Made from Polypropylene. Available in two sizes: one holds size "00", conical, and bottle neck capsules; the other holds size #3 capsules. Available in white or clear. BEEM® is a Registered Trademark of Better Equipment for Electron Microscopy, Inc.
Multi Task BEEM Capsule Holder: Exclusive !!!! This Multi-Task BEEM Capsule Holder is an innovative holder designed to hold size "00" BEEM capsule during resin polymerization. This holder is also a perfect tool when embedding and polymerizing resin by microwave, especially when the embedment needs to be performed under water. The direct contact of the microwave energy to the resin inside the microwave is usually causes the resin to heat to quick and that leads to micro bubbles forming inside the resin block and this causes unknown damage to the tissues. To help eliminate this problem, the resin capsule should be immersed in the water bath during microwave irradiation of the resin. This 'indirect contact' of microwave energy to the resin will help the embedding block polymerize nicely and homogeneously and also avoids the overheating of the tissue. Mold is machined from polyethylene block, comes in two parts: bottom part which holds the BEEM capsule, and the second part which is placed on top and is securd by two plastic screws to ensure the BEEM capsules are in place and capsule lid will not pop out during under water polymerization or microwave irradiation. 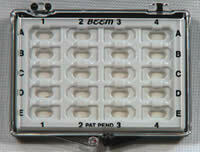 Accompanies is microwave transparent tray, which holds water and capsule holder for microwave processing. Measures: 1⅛" L x 3" W x 2" H , accommodates 24 capsules. You can order either the Multi-Task Capsule Holder only, or the set which includes one Capsule Holder and one Tray. 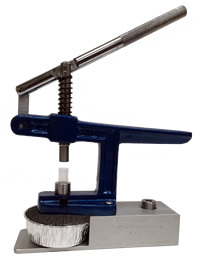 The EMS Capsule Press is designed to facilitate the removal of blocks, size 00 and 3, from the capsule without any damage to the block tip whatsoever. 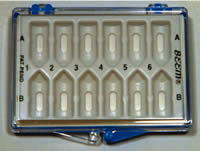 For the storage of 15 capsule blocks in numbered cavities. Mold fits perfectly inside the cocoon box BE8 (64300-8); See Cocoon Box section. These molds are reusable. Each cavity measures 12 mm (L) x 5 mm (W) x 3.5 mm Deep. Overall mold measures: 94 x 56 x 14 mm. Natural, hard gelatin capsules. To be used as an embedding mold for water miscible resins, or resins which need to be cured by transmitted light. Gelatin capsules dissolve or disintegrate within 5 minutes when immersed in a 0.5% HCl solution at 36-38°C, within 2 minutes in water at 37°C or in artificial gastric juice. Our large size gelatin capsules are ideal for storing either delicate or small items. It is also suitable for use as an embedding mold for paraffin or paraplast. The capsules come complete with a locking ring. A variety of sizes are available. Made from durable polyethylene. It accommodates 15 gelatin capsules size "00". The whole capsule is exposed to allow for even heat and/or UV light distribution during polymerization. Measures: 5" (L) x 3" (W) (127 mm x 76 mm). Introducing the EM5 - an innovative new design based on the widely used Ø8 mm size embedding mold. The unique two part design allows for easy removal of resin blocks, as well as incorporating many other advantages over currently available embedding products. A newly designed mold which is convenient and offers better embedments. 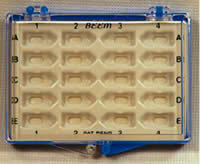 This tray-and-mold in one unit offers a unique specimen block that no other mold can. They form a Universal Block. Free Airflow for Even Polymerization. Easy to Remove the Polymerized Block. Due to the softness of the bottom of the mold, to release the block simply push the bottom of the mold with your thumb and your block will just pop out. There is no need for razor blades or a Capsule Press! Each tray contains 2x10 block molds and measures 87x66mm. 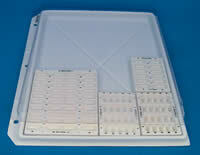 Are your bench-tops and drawers crowded with petri dishes and pillboxes full of various sized specimen blocks? Have you been spent hours to look for a block for re-sectioning? Do you wish you could neatly catalog, file and store all of those blocks in one convenient place? The system consists of four newly designed Blocklock® storage modules (#69956, #69957, #69958, #69959) and a Covered Mounting Panel (#69950) that fits in a standard " D-Type" 3-ring binder (optional) – A 1-inch binder will accommodate two Covered Mounting Panels, and 1.5-inch binder accommodates three Panels. Each Blocklock module has an adhesive backing which when exposed permits it to be permanently mounted on any grease-free surface. All Blocklocks can be inserted in a Plastic Protective Box (EMS #69956-B & 69958-B, #69957-B, and 69959-B) or, by utilizing the adhesive feature, mounted in combination with other Blocklock modules on the BEEM® mounting panel (EMS #66950). This new Storage System 2000 permits blocks size "00", size "3", and BEEM® flat embedment to be indexed, combined under one cover along with any associated data sheets, and stored upright in 3-ring binders, on the shelf, at your reach for ready reference. Introduce the front of the block at a slight angle into the rear of the cavity and gently push it forward until it nests in the recess. Heavy-duty, two tone plastic boxes are supplied with indexed, translucent labels, which can be applied to the top or bottom of the box. With clear cover is designed to accept both Blocklock Storage Modules and BEEM® original Dial-A-Grid (EMS #71148) and Block Storage Modules (EMS#69922), which can be attached to the panel using double sided adhesive tape. Grid storage boxes from other manufacturers may be attached this way also if they do not exceed ⅜" in height. Ordering: Note: Blocklocks and their Storage Boxes are sold separately. Please see listing in the molds section. 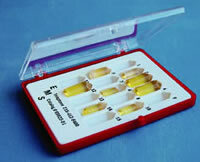 These capsules measure 12mm in diameter and are 11mm high. They are available in two different pore sizes: 30 and 78 microns. Both the top and the bottom are made from a stainless steel mesh, which offers good fluid circulation. Has a male and a female threading for secure closure. This basket is brass with a stainless steel mesh attached to both ends. To use, simply screw both halves together and you can keep small specimens for long periods of time during the process of fixing, dehydration or even critical point drying. 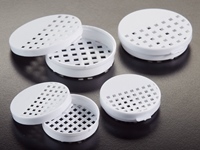 It can also be used to hold small parts for ultrasonic cleaning. Mesh opening: 300 µm. Brass/Nickel plated. Coverslips can be stacked with spacers (up to 15 coverslips with a thickness up to 2mm) with samples placed on top of each coverslip. Fluids freely exchange between coverslips. Both spacers and weights come with the unit. The upper part of the holder is grooved to accept tweezers. Machined from solid steel, brass/nickel plated; incorporates a stainless steel mesh top and bottom to allow for fluid exchange. EMS has introduced and is now available a variety of Stainless steel baskets with lids and multiple compartments for critical point Drying. These baskets are either 15mm in diameter or 23mm. 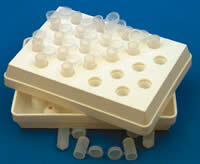 These capsules are suitable for holding tissue samples during processing. The lids have a frosted write-on area for sample identification and an open mesh area to facilitate fluid exchange. The entire surface of the base is also an open mesh. The lid snaps securely on the base, eliminating the risk of tissue loss during processing.